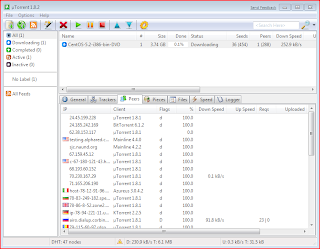 utorrent is a very small bittorrent client for windows. bittorrent allows you to download files from other people that are downloading it at the same time. Traditionally, you could download a file just from the site that offered it. However, really popular file downloads would overwhelm the site, so everyone would have a hard time getting the file. bittorrent allows all the downloaders of a file to upload some of the file to other people trying to download the file at the same time. Think of it like this. You have a 100 page book. You rip up that book, and give one page to each of 100 different people. Now, when someone ask for a copy of the book, they can go to each of the 100 people and just ask for a copy of one page, which is trivial to do, instead of asking one person to copy 100 pages, which is a pain. Once they have talked to all 100 people, they will have a copy of the book. And as soon as you have at least one page, people can ask you for copies of those pages too. So, everyone in the torrent becomes a downloaded and a contributor. It spread a small amount of work over a lot of machines, versus normal downloading, which puts all the work on one of only a few machine. Ironically, bittorrent works best when large numbers of people that are download a file. * Choose to open or run it while downloading in your browser. * Open the torrent file by double clicking or drag-and-dropping onto the µTorrent window. µTorrent finished downloading, but now it says it's Seeding. What does that mean? Seeding is where you leave your BitTorrent client open after you've finished your download to help distribute it. You can either stop seeding or let it continue. If you let it continue, other people will be able to download this fle faster thus helping this community. In short, you don't. You should treat something downloaded with BitTorrent just like any file downloaded from the internet - that is, if you don't trust the source of the file, then you should use caution when opening it. If the torrent site you obtained it from offers comments, be sure to read those first. But regardless of the comments, running a virus scan on the downloaded files is usually a good idea. µTorrent guarantees that the content you download is not altered from when the torrent was originally created, but if the source files used to create the torrent were already infected, this will provide no protection! and and cap quality of the picture. This special remedy is worth of saving live & evidence is present as it has alread helped to drop out so many peoples smoking habit. purchase Cymbalta (Duloxetine), as it is a terrific medication in treating depression. taken even without taking meals but can still affect the patient's appetite during lunchtime. in the advantage of thee customers. Forr a great example oof a project schedule, go here.